We have definitively arrived at the moment where Bob Dylan became uncool. If you watch Dylan from his earliest appearances on television or on stage at Newport in Murray Lerner’s documentaries or in Dont Look Back (especially!) Dylan seems to have been the coolest man on the planet. Watch the concert scenes in Renaldo and Clara and he was still the coolest man on the planet. Concert for Bangladesh and The Last Waltz? Still unbelievably cool. 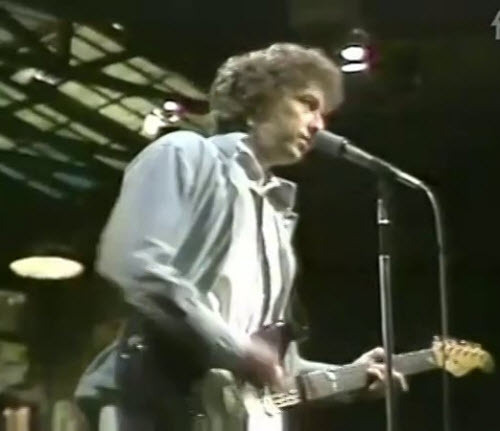 Now go watch Bob Dylan’s only appearance on Saturday Night Live. As he didn’t sing in Hattie Carroll, “now is the time you’re not cool”. 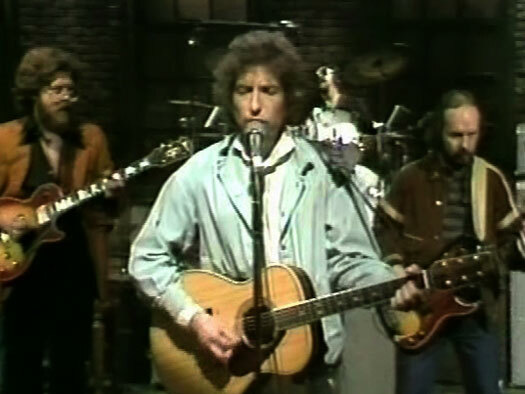 Bob Dylan appeared as the musical guest in second episode of the fifth season (20 October 1979). A bearded Eric Idle was the host. This was in the Bill Murray, Gilda Radnor, Lorraine Newman era – no Chevy, no Dan, no Belushi. You can watch the entire episode online here. Watching old SNL is an odd experience. I was ten when this aired, so I didn’t see it then (I didn’t really see SNL until Eddie Murphy was part of the cast). The opening bit is ok, and most of the stuff with Idle isn’t great. The news segment is great. The best part of the whole thing – by miles – is the appearance by Andy Kaufman in his “I wrestle women” phase. He was an unbelievable heat magnet at this point in his career. That is a surreal experience. Most of the skits aren’t bad. What is bad is Bob Dylan. Dylan does three songs: “Gotta Serve Somebody” (12:24 into the episode), “I Believe in You” (39:02) and “When You Gonna Wake Up?” (59:39). He never looks happy, not even for a second. He stands out there on stage dressed like a dad taking his kids to soccer practice. Gone are the sunglasses and awesome Rolling Thunder hats. Here is a button down shirt and faded denim jacket. He is the embodiment of anti-cool. Look at his band! Off to the side are four back-up singers (three women, one men). They are awesome – all decked out in spangly disco outfits. With Dylan looking like he just stepped out of the minivan. These performances are pretty terrible. That may be a function of the genre. In almost forty years SNL has produced only a handful of truly memorable musical performances (Elvis Costello booting “Less Than Zero” for “Radio Radio” and getting banned; Simon and Garfunkel not looking at each other in the second episode ever; Sinead O’Connor ripping up the pope; Ashlee Simpson trying to lip-sync to the wrong song). In fact, if you google “Best SNL Musical performances” the top picks are Kanye West and Nirvana and Arcade Fire. I had forgotten all of those. As I say, not memorable. Dylan is unforgettable, for all the wrong reasons. Lifeless, humourless, dour – this is why people hate the Christian period. Here’s a clip of “Gotta Serve Somebody” that I can’t get to embed right now for some reason.